This course is delivered by Kingston School of Art. 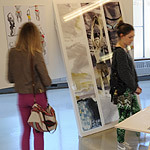 Kingston School of Art has its roots in the studio-based approach of Britain's art school system (the original School of Art was founded in the 1890s). Today, for most courses, learning still takes place in our specialist studios, each subject area having its own fully-equipped studio, where you take part in classes, tutorials and critical reviews with fellow students. This strong studio culture also ensures regular interaction between students and tutors. For non studio-based courses, learning takes place in classroom-based seminars, tutorials and lectures, alongside site visits to museums, galleries, auction houses and other creative professional environments. project work and workshops with visiting lecturers and industry specialists. Our excellent reputation means that industry leaders regularly visit our student shows to see the best of the new talent. Where is Kingston School of Art based? Kingston School of Art is based at Knights Park, where our well-equipped facilities offer a modern study environment so that you graduate with cutting-edge skills and knowledge. A joint BA/MA staff team includes: Carl Clerkin, Rodrigo Gonzalez, Julia Georgallis, David Weatherhead, Alex Hellum, Lucy Kurrein, Max Frommeld, Fabien Cappello, Rosemary Anrude and Sebastian Bergne. See student project work from the Design: Product+Space MA programme.